Curtis Stone at Maude in Los Angeles. Photo: Ray Kachatorian. Peter Barrett quizzes Curtis Stone on the best LA has to offer in food, wine and farmers markets. Melbourne-born chef Curtis Stone landed in Los Angeles at the age of 30, auditioning for a television pilot called Take Home Chef. Eleven years and 140 episodes of that successful show later he finds himself married to a local (actor Lindsay Price) with a family (two boys, Hudson and Emerson) and two restaurants (Maude and Gwen Butcher Shop & Restaurant). The great thing about LA, to me, has always been its downtown Mexican food. Sure, there are food trucks but there are also guys that set up a little charcoal-burning barbecue and a table and that’s it. 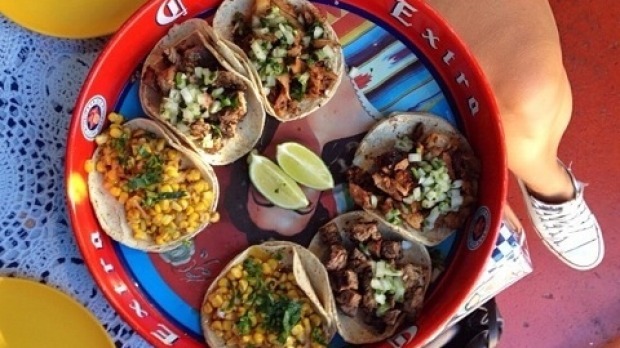 They’re all soft-shell tacos so expect carnitas, carne asada and barbacoa tacos for $US1 to $1.50 each. Drive down Western Avenue in East LA until you hit Pico Boulevard and turn east. Drive a little further and you’ll find amazing taco stands all the way from Vermont Avenue over the next few blocks. But it’s more a late-night thing; they’re not around during the day. The sushi in this city is substantially better than anywhere else that I’ve had it in the world. One of my favourites is Sushi Park (8539 Sunset Boulevard #20, West Hollywood, +1 310 652 0523). It’s up on the first floor and there’s a big sign on the front: ‘No trendy sushi, no California rolls, no takeaway’. But it’s just fabulous. Another outstanding sushi place is Asanebo (11941 Ventura Boulevard, Studio City, +1 818 760 3348). It’s out of the way a bit, in the valley, but it’s one of the prettiest places you could visit. In the past there was the Ivy (113 North Robertson Boulevard, West Hollywood) but today you’re just as likely to sit next to Kate Moss in a little taco stand in the valley. But you can still try Craig’s (8826 Melrose Avenue, West Hollywood, +1 310 276 1900), Cecconi’s (8764 Melrose Avenue, West Hollywood, +1 310 432 2000) and, if you know someone who can get you in, Soho House (9200 Sunset Boulevard, West Hollywood, +1 310 432 9200), a private members’ club with an unusual and gorgeous view of LA. California is blessed with microclimates that can pretty much grow anything and LA is known for its farm-to-table cuisine. I go to Highwood Farmers’ Market (on Sundays) but Santa Monica Farmers’ Market is just as good (Wednesdays and Saturdays). The key is getting there early so you can get your food before it gets too hot. There’s a guy there called Harry, from Harry’s Berries, who grows five or six different varieties of strawberries, including gaviota: these strawberries are just like little lollies – you’ve never tasted anything like them. Be there on the stroke of eight o’clock to get yourself a punnet – Harry sells out in a heartbeat. There’s a pretty decent Thai Town in North Hollywood where you can find good little Thai grocers. There’s also a super-vibrant Korea Town, which is a little deeper into Hollywood, down into LA proper. Lindsay’s mum is Korean so we go down quite a bit. She makes her own kimchi and she’ll do bulgogi and all the Korean barbecue stuff that is so good. There’s a little spot called the Oaks Gourmet Market (1915 North Bronson Avenue, Los Angeles, +1 323 871 8894); they do a great bacon and egg burrito and they roast their own beans in-house and make fabulous coffee. They’ve also got a really nice selection of cheeses and charcuterie and make little sandwiches; they also have great craft beer and rosés. Before you come into LA you should look up who’s playing at the Hollywood Bowl (2301 North Highland Avenue, Los Angeles, +1 323 850 2000), splurge and get yourself a little Garden Box, as they’re called – two or four seats near the stage. Then pick up a picnic basket and buy some nice wine and whatever and take it all in with you while you watch the concert. There’s also Hollywood Forever Cemetery (6000 Santa Monica Boulevard, Los Angeles, +1 323 469 1187), where you can see movies play. It sounds a bit creepy to lie out in the cemetery and watch a film, but it’s kind of fun. The Hotel Bel-Air (701 Stone Canyon Road, Los Angeles, +1 310 472 1211) is pretty special. You can park right there at the hotel (a valet will park your car for you) and Wolfgang Puck has a restaurant inside. It’s one of those sprawling, beautiful hotels that has gorgeous gardens. There’s also the Polo Lounge at the Beverly Hills Hotel (9641 Sunset Boulevard, Beverly Hills, +1 310 887 2777), which is pretty cool, too. Both are a little ritzy and celebrity-oriented. Five years ago I could have given you a list of 20 but these days things are a bit different for me [with young kids]. There’s a really cool, old Hollywood sort of spot at the Roosevelt Hollywood called the Spare Room (7000 Hollywood Boulevard, Los Angeles, +1 323 769 7296), which has two lanes of bowling and a big sort of loungy cocktail bar. If you’re into clubs there’s the Dream Hotel (6417 Selma Avenue, Hollywood, +1 323 844 6417), which has just opened and has TAO Restaurant, Beauty & Essex and a big rooftop bar called the Highlight Room. There’s also a pretty hot sort of nightclubby bar just down the road called the Warwick (6507 Sunset Boulevard, Los Angeles, +1 323 460 6667) or, for an award-winning cocktail bar, try the Varnish (118 East 6th Street, Los Angeles, +1 213 265 7089) for fabulous cocktails. In my opinion Santa Barbara, which is only an hour away, is one of the nicest wine regions in the world. They’re probably not as polished in terms of cellar doors as the Napa Valley but they grow so many grape varietals down there, including great chenin blanc, sauvignon blanc and chardonnay. One producer that’s doing something a bit different is Solminer. It makes a gruner veltliner that I love. It’s bone dry but interesting – it’s more a Germanic, Austrian-style wine. Chaumont Bakery & Cafe (143 South Beverly Drive, Beverly Hills, +1 310 550 5510) is just off the beaten tourist path and has fantastic pain au chocolate and croissants and eclairs. I’ll spoil the kids by stopping in there. This story first appeared in Fairfax Media’s Epicure/Good Food on Tuesday, 12 September 2017.